Doha, Qatar, 2 October, 2018: Barwa Bank, Qatar’s most progressive Shari’ah compliant financial service provider, announced the grand prize winner of Salary Transfer promotional campaign, at the Bank’s headquarters. The final draw was held under the supervision of a representative of the qualitative license and market control department at the Ministry of Economy and Commerce. The winner was Mr. Mohammad Raja Aljaowni who drove home a brand-new Lexus LX 570; a grand win that marked the culmination of 5 previous draws that were held during the campaign’s period and led to the win of 25 customers - 5 customers per draw - with cash prizes of QR 20,000 each. 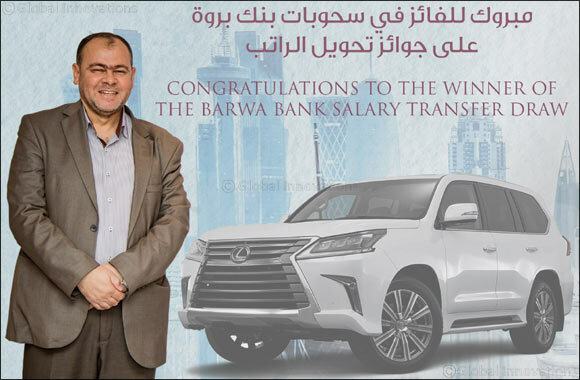 Barwa Bank’s Salary Transfer promotional campaign, that started in March this year and ended in August 2018, aimed to offer the bank’s customers a chance to win cash and other rewards that sum up to QAR 1 million. In addition, the new salary transfer customers, who had or opened a Thara’a Savings account during the campaign’s lifetime, had the advantage to get double winning chances in the monthly, quarterly and the biannual 1,000,000, Thara’a prizes. On this occasion, Mr. Khalid Al-Subeai, Barwa Bank Group Chief Executive Officer, said: “At Barwa Bank, our aim is to provide the best banking experience by providing the right products and services to our customers that are both Sharia’h compliant and in line with the modern banking offerings. The concept behind Salary Transfer campaign reflects our strong belief in the importance of long-term relationships with our customers and the provision of comprehensive banking solutions to cover all their financial needs. This confirms once again Barwa Bank’s commitment to always provide highly innovative services that reflect the bank’s vision and meet customers’ expectations”. Barwa Bank offers various Shari’ah compliant financing solutions, deposits, debit and credit cards, with the aim to satisfy all customers’ needs. The bank also offers an extensive variety of personal banking products and investments, as well as seven strategically located branches and a broad network of ATMs located across Qatar. Customers can access their accounts from the convenience of their office or home through the state-of–the-art online banking, or via the 24/7 Contact Centre.